Positively addictive, these chewy caramels are made from coconut palm sugar, then topped with puffed brown rice. The decadent, rich caramel is dipped in bittersweet chocolate, and finished with a delicate dusting of sea salt. It’s no wonder these handmade bars have a cult following. Learn more about Kika’s Treats on their website. As with most chocolate-y, caramel-y confections, I recommend selecting a black tea to enjoy with this treat. I selected this Bolivian Whole Leaf Black Tea from KTeas to drink while tasting this candy, and it was the perfect choice. The deep caramel-y flavors of the tea complemented the sweetness of the candy without adding a more cloying taste to the palate. Instead, it actually seemed to refresh and cleanse the palate. Delightful! Let me say that again: WOW! What really surprised me with my first bite was the crispy puffed brown rice. Having not read the description of these caramels before taking a bite, it was a pleasant surprise to discover the crackly crunch of rice “crispies” in this confection. 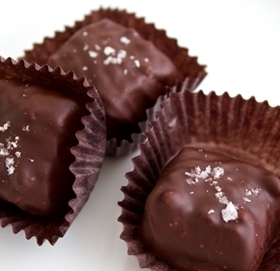 The bittersweet chocolate is just a thin shell of chocolate, but, it provides the perfect ratio of bitterness to the candy. I really like the balance of tastes. Yes, it is sweet, but it is also salty with just a hint of bitter from that chocolate. One confection tastes neither too sweet or salty or bitter, but, it is sweet enough to satisfy the sweet tooth after just one confection. The caramel is made from coconut palm sugar, and while I don’t taste a lot of coconut influence in the overall confection, I can taste a hint of coconut there. The texture of the caramel is slightly hard to the tooth when I first bite into the candy, but it quickly gives way and becomes chewy and softer. I think what I’m enjoying most about these chocolates is that they possess not only a delicious balance of contrasting flavors but also contrasting textures, from the snap of the chocolate to the chewy caramel and crispy rice and crunch of the salt on top … these little squares are packed full of flavor. These caramels are really delicious. I don’t know that I like them better than my beloved Fran’s Caramels, but Kika certainly could give Fran a run for her money! I like that this isn’t made from corn syrup (yeah, I know that they say “sugar is sugar” but I like it when I find a candy company that uses alternative sweeteners). Not only does my sweet tooth approve, but somehow, I’m able to rationalize that these are better for me than the average candy bar, and I appreciate that. Normally, I’d publish tea reviews on one of two tea review blogs to which I contribute: SororiTea Sisters or the Tea Review Blog. However, since this tea was part of the Jump Start My New Year Tasting Box from Foodzie, I decided to review this tea here on my foodie blog. This is tea for coffee lovers: Rich, dark, with hints of caramel and dark spice. Pu’er is green tea that’s been sun-ripened, which both mellows its flavor and increases its healthful compounds. These are believed to aid digestion, assist in weight loss and eliminate alcohol toxins. Learn more about Five Mountains on their website. It’s no big secret that I love tea. But I don’t love all tea, and I believe I mentioned on my article about the arrival of my Jump Start box that I’m not the biggest fan of Pu-erh. And I’m not. If I had to list my teas in order of preference, Pu-erh may not end up as the last on that list, but it would certainly rate in the bottom three. That being said, I am slowly developing an appreciation for Pu-erh, as I am finding more and more Pu-erh teas that I’ve actually enjoyed. They weren’t just “drinkable” but actually enjoyable. This Pu-erh from Five Mountains certainly rates as enjoyable. It is a rich, flavorful Pu-erh (or Pu’er, as Five Mountains calls it) with a beautiful sweetness that tastes similar to caramel. There is also a warmth to this tea with hints of gentle spice. It is earthy and a little brine-y which is often expected in a Pu-erh, but, it is not quite as brine-y as some Pu-erh teas that I’ve tried, and I appreciate that. Some Pu-erh teas can be almost fishy in taste, and it is that fishy taste that makes me not so fond of Pu-erh. I am glad that this is NOT fishy, only a little salty perhaps, and it is a distant flavor that doesn’t disrupt the aforementioned rich caramel-y flavor and spiced tones that I find so enjoyable about this tea. In fact, the hint of salt in the background may actually work to this tea’s favor, accenting the robust flavors of the tea just right. This tea is remarkably smooth from start to finish, with no bitterness or astringency. Just sweet, rich flavor that makes the tea an absolute pleasure to sip. If all of my Pu-erh experiences were as positive as this one, I wouldn’t have had to preface this review by saying I’m not a big fan of it, because this is grand! We think we’ve found a perfect combination of sublime flavors: Pomegranate, Vanilla, and Cashews. Our whole roasted Cashews are teamed with Pomegranate and Apple, and balanced with pure Vanilla bean. Our light glaze adds just the right amount of sweetness. 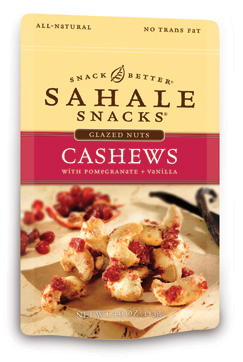 Learn more about Sahale Snacks on their website. Sahale Snacks can be found at Whole Foods Market. While these would be delicious served with a hearty black tea, I recommend trying a green tea with this delicious snack. 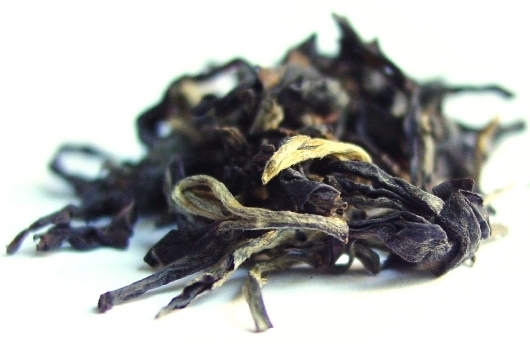 Try this Valley Peak (Ding Gu Da Fang) from Madala Tea. The sweet, nutty flavor of the tea is very reminiscent of a cashew, and I think that it highlights the nutty taste of this snack. A delicious pairing! And I was not wrong about loving it. It is really delicious. With the first few bites, the cashew flavor was a little obscured by the sweetness of the glaze and the vanilla overtones, but, after those initial bites, the cashew flavor started to come through. The glaze gives the nut a sweetness without adding a tremendous amount of texture. It isn’t a heavy or candy-crunchy kind of glaze that you might experience from a brittle. The vanilla is a strong note at the beginning but after popping a few morsels in my mouth the vanilla tones started to taper as the other flavors emerged. The dried pomegranate arils lend a slight tangy note to the flavor, but it isn’t sour or overpowering. They also add a very pleasing texture to the snack: chewy and satisfying. In fact, I think what I am enjoying most about this snack is contrasts in texture as well as flavor. It is crunchy and chewy, while tasting sweet, nutty, salty, and tangy. This is a deliciously different, healthy (and certified gluten free) snack that satisfies many different types of cravings. The best part, at least in my sweet tooth’s opinion, was the last bit that was at the very bottom of the pouch that was loaded with vanilla powder and loose pomegranate arils. It was deliciously chewy and sweet. YUM! And I also LOVE that these are local treats, made right here in the great state of Washington! 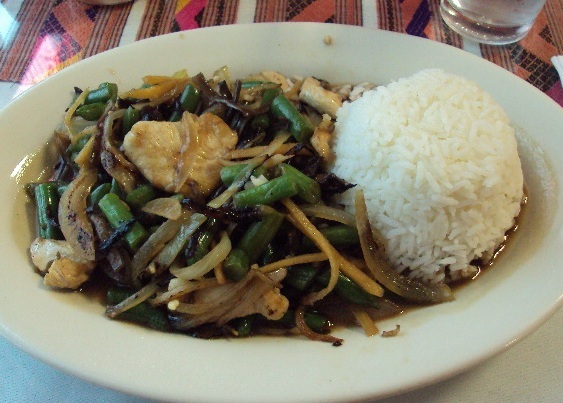 As I’ve mentioned before, I love Thai food. I don’t know that its my favorite ethnic cuisine, but, it certainly ranks within the top three. 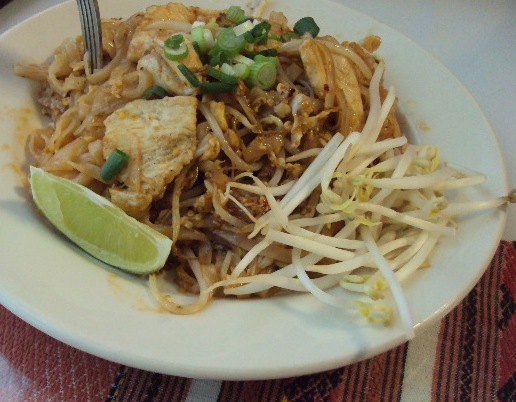 And that love for Thai food revolves pretty much around one dish: Pad Thai. I’ve tried a few other Thai dishes that I really enjoyed, mostly noodle dishes with a gravy, but, it’s been years since that time and I really do not recall what they were called. I’ve tried to find those on Thai restaurant menus to no avail, as nothing really seams familiar. That being said, I still prefer Pad Thai to those other dishes. However, I did want to expand my experience of Thai cuisine so with the gentle urging of my husband, I did just that with this visit to Kesone Thai Lao Bistro, another Living Social restaurant find . 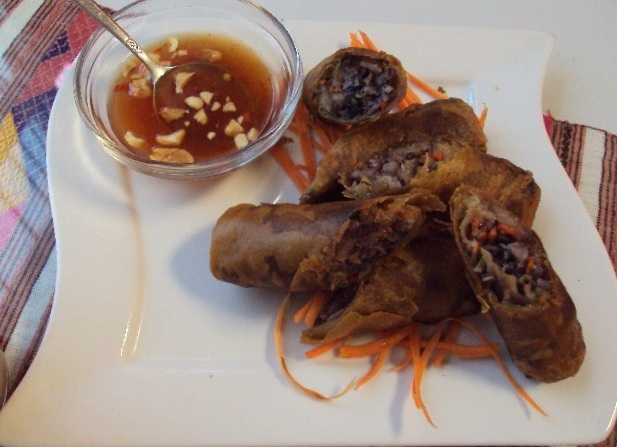 . .
Order: for an appetizer, my husband and I shared an order of Crispy Spring Rolls. My husband ordered the Pad Thai with Chicken ($7.50) while I tried the Pad King with Chicken ($7.50). And of course, I had to have a Thai Iced Tea! This small restaurant was empty when we arrived (with the exception of one guest who was waiting for a to-go order), then again, we arrived just before they close for the afternoon (they close between the hours of 3 pm and 4 pm to prepare for their dinner service). Had I read their website a bit more carefully I would have noticed this and been a bit more observant to their closing time. The decor of the restaurant is nothing fancy but the tables were clean and I felt at ease with my surroundings. The service was fast (which probably had something to do with the fact that we were the only guests to be served). I was very pleased by the size of the Thai Iced Tea – it was quite large! Unfortunately, the tea tasted slightly watered down. The black tea had notes of bitterness to it, which suggested that perhaps the tea had been steeped too long. It was still drinkable, but, not the most enjoyable Thai Iced Tea I’ve had. Our Spring Rolls arrived at the same time our entrees arrived. In most cases, I prefer my appetizer to arrive a little before the entrees, however, the food arrived so quickly that it wasn’t as though we were waiting for either dish. The Spring Rolls were a little dark in color (looking as though they might have been cooked just a bit too long), but they didn’t taste burnt. They were crispy and delicious. I especially enjoyed the sauce which was pungent with garlic with a nice balance of sweet and sour. My husband and I shared our entrees. The Pad Thai was ordered with a heat level of 2 – 3 (the server asked on a scale of 1 – 5 how spicy he would like it to be), and in my opinion, it was a pleasant amount of heat, although my husband said he would have liked it a tad spicier, and next time he will probably order it at a level 3 – 4 instead. The chicken was tender, and I enjoyed the ratio of noodle to sauce. The sauce did not taste too fishy nor smell too fishy, which made me happy. It was certainly a tasty Pad Thai, and while it isn’t my favorite Pad Thai of Portland, it was my husband’s favorite of the ones we have tried thus far. The Pad King was a bit of an adventure for me, as I had not tried it before. The onions were nicely caramelized and the rice was cooked perfectly. The sauce of this dish was very flavorful; however, it had a flavor that I think would have been more complementary to beef rather than chicken, as it had a very substantial, almost beefy sort of flavor to it. The sauce seemed to overwhelm the chicken, and if I were to order this dish sometime in the future I would definitely order it as a beef dish, and that is how I’d recommend ordering it. My favorite part of this dish were the mushrooms, which lent a nice texture and delicious flavor to the dish and it is because of their somewhat woody flavor that I suspect beef would have been a better meat choice for this dish (tofu would also make a nice choice). The green beans had a slightly rubbery texture, and I didn’t find this to be too appealing. Overall, I found the dish to be agreeable, but I think I would have been happier if I had chosen the Pad Thai. While I wasn’t totally pleased with my Pad King, I am happy that I was willing to step outside of my comfort zone and try something a little different. The flavors were definitely there in each of these dishes, and overall, I enjoyed my visit to Kesone Thai Lao Bistro, and we will no doubt be returning at some point. Mostly, I was just happy to be eating Thai food again! 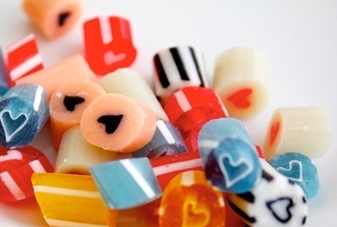 Old-fashioned candy-making has a hint of romance and whimsy to it, and when we saw these pretty and playful sweets from Papabubble, we nearly melted with delight. Fancifully colored, striped, dotted, filled with hearts, these candies are as tasty as they are pretty. The stretching technique they use on the sugar creates candies that melt away to the point that they crunch delicately between your teeth — no tooth-breakers here. Truly hand-made, candies like these are a rare treat in a fast-paced world. What better reason to eat these slowly, savoring each beautiful bauble one by one? Learn more about Papabubble on their website. I poured myself a cup of Ceylon Silver Tips from Empire Tea Services to enjoy with these little gems. I found that the delicate, light flavor of the tea allowed for full enjoyment of the sweet flavor of the candy, and with each new flavor of the candy, the tea seemed to take on a whole new personality! A wonderful tea pairing, indeed. Of all the treats that arrived in this month’s Valentine’s Day Tasting Box from Foodzie, this was the one I was least excited about. Don’t get me wrong, I love just about any kind of candy, but, as this was tucked amidst an array of chocolate confections, these beautiful hand-pulled hard candies just didn’t enchant me the way the chocolate selections did. But these are incredible. These ARE NOT the same hard candies that I remember sitting in candy dishes at Christmastime when I was a kid. These little beauties were made with creativity, love and care … and that love can be tasted as it melts on the tongue. These are true works of art, not just to the eye, but to the palate as well. The little sampler pouch that arrived in the tasting box held approximately two dozen of tiny candies in assorted colors and each color represented a different flavor. The first one I tried were the black and white candies which tasted of licorice, and I suspect that these were the aniseed. They quickly became my favorite! But then I tried the pale purplish-blue candies tasted like lavender and I loved those too! The pink ones with the little black heart in the middle had a tartness to them that tasted like pink grapefruit. YUM! I found myself falling in love with each new flavor that I tried. I thought that these hard candies would be boring and not unlike the average hard candy you can find in the bulk section of the grocery store. Oh, how wrong I was! These are absolutely delicious! I love them! These super-fresh pistachios are sweet, rich and intensely nutty. We love them straight from the shell, but encased in dark chocolate, they take on new heights of awesomeness. Learn more about Fiddyment Farms on their website. Oh. My. Goodness. Yet another item I found in a Tasting Box from Foodzie that I can’t stop eating. These are absolutely amazing. As it is, I like pistachio nuts so I was fairly certain I’d enjoy these Dark Chocolate Covered Pistachios from Fiddyment Farms. But I was not prepared for just how much I’d like them. The pistachio is so crunchy and adds a nice nutty flavor and roasted element to the confection. At first, I didn’t think I was noticing much salt with the nut, but every once in a while, I taste a hint of saltiness. But this is not the typical sweet-and-salty kind of confection. That being said, I don’t know if I would want it to be. It seems quite perfect, just the way it is. So YUMMY! My only complaint is that the Foodzie box came with just 4 ounces of this product, and now I find myself wanting more. 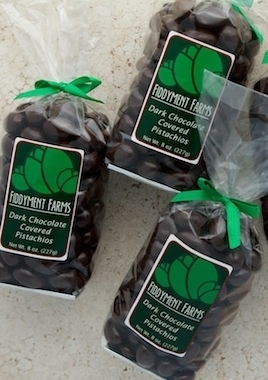 The full-sized package from Fiddyment Farms is 8 ounces … now that is more like it! This was a surprise visit! We were out shopping with our youngest daughter, and her favorite food is BBQ ribs. We decided to try Rib City Grill, and I’m glad we did. Definitely worth a visit! I hope Rib City doesn't mind me using this photo from their website, I didn't bring my camera with me on this outing! Order: I ordered the full rack of baby back ribs which were on special for just $9.99! My husband ordered the combo plate, with a half rack of ribs and smoked turkey. We could smell the BBQ goodness as soon as we walked in the door. We were all very hungry so we were ready to eat! The special on the board just inside the door announced that a full rack of “Baby Babies” was just $9.99 and really, how could you beat that? Along with the full slab of ribs, I got my choice of two sides, and I chose the baked beans and french fries. Also accompanying the meal was a thick slice of garlic toast. The ribs were perfectly cooked. They were super tender – we’re talking melt in your mouth tender – and the bones just slid right out of the slab of meat! I like the way it was cooked on the outside, with just a little bit of char on the edges. They were sauced (or rubbed?) with seasoning prior to cooking (or perhaps basted while cooking), but I added some of the sauce. I enjoyed both the Tangy and the Sweet sauces, and I found that what I liked best was to combine these two together. My husband shared with me a slice of his turkey, and I’ve got to say that it was very delicious as well. Super moist and tender. I kept finding myself returning to the bowl of baked beans. They were just the way I like them, just what I remember from going to barbeques as a kid … the beans were tender and the sauce was sweet and a little sticky, as if it had been cooked and reduced and caramelized a little. The garlic toast was good, although it was a little predictable. Basically, it was a piece of Texas toast that had been buttered and then grilled until toasty. Tasty, yes. Worth writing about beyond this? No. The french fries are the same: golden brown and delicious, I liked that the skins were still on them and that they were crispy, they tasted fresh. But what made that meal special for me are the ribs, and I guess that’s the way it should be. If you want fries, go to McDonalds! (or better yet, go to Little Big Burger!) 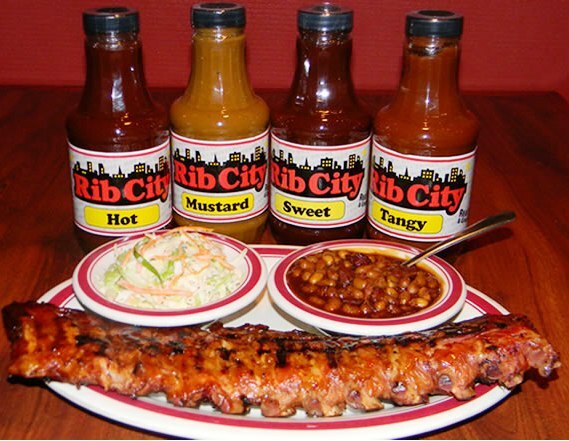 If you want a yummy, sticky, messy BBQ meal that is sure to please all the carnivores out there, go to Rib City! Editor’s Note: After a recent return visit, we’ve come to discover that the Baby Babies Full Rack deal on Sunday and Monday is now $11.99. Still an excellent deal.